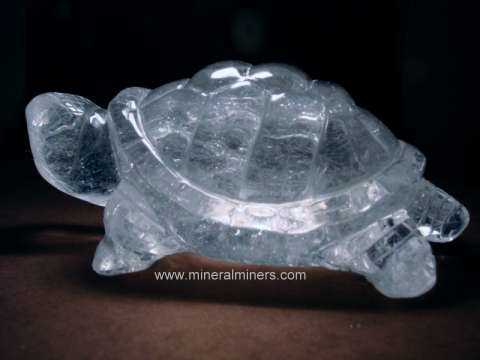 Try our Natural Lemurian Quartz Lapidary Rough Satisfaction Guarantee - compare our prices and our superior quality. 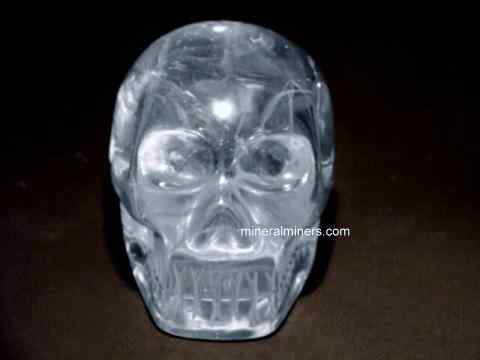 Click on any natural lemurian quartz lapidary rough image below to enlarge it. Quartz Crystal Dimensions: 4.7" long x 1.7" x 1.4"
This quartz crystal specimen has rare transparency with a large internally flawless portion inside the crystal. 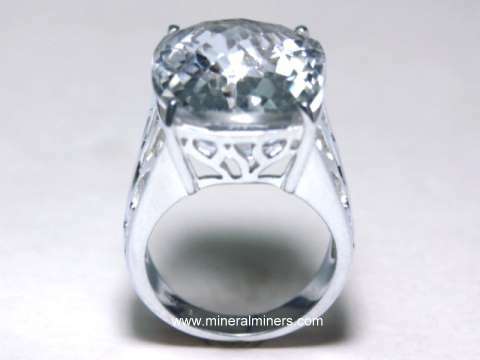 It is over 90% internally flawless inside, and it could be faceted into 400 carats of gemstones! The surfaces show some broken and abraded areas, and the recuperated tip is in excellent condition. 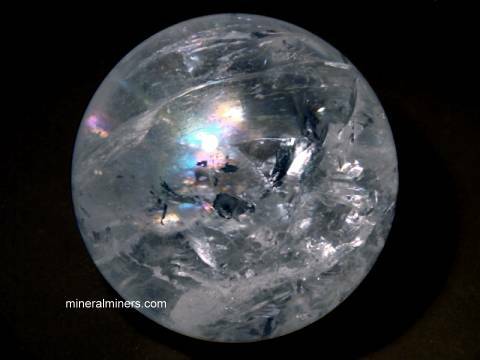 It is colorless with a tapering shape, and it has semi-vitreous to vitreous luster with very well-developed horizontal striations on some alternating prismatic faces. Natural quartz crystals with these characteristics, from this particular mine in Brazil, are popularly referred to as Lemurian Seed Crystals. This crystal makes a great specimen just as it is, although it could also be used as fine quality lapidary or facet rough. Quartz Crystal Dimensions: 5.8" long x 2.4" x 1.6"
This quartz crystal specimen has rare transparency with a large internally flawless portion inside the crystal. 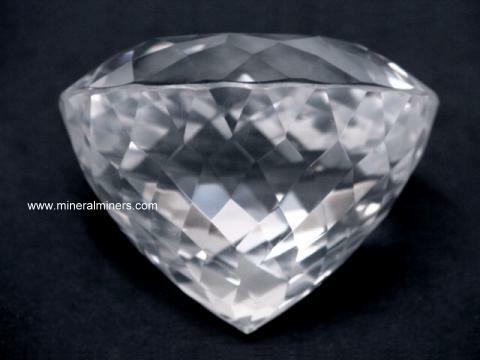 It would yield a totally clean block weighing about 1/2 pound, and it could be faceted into a large gemstone weighing 500 carats! The surfaces show some broken and abraded areas, and the recuperated tip is in good condition. There is a very faint internal phantom near the tip. 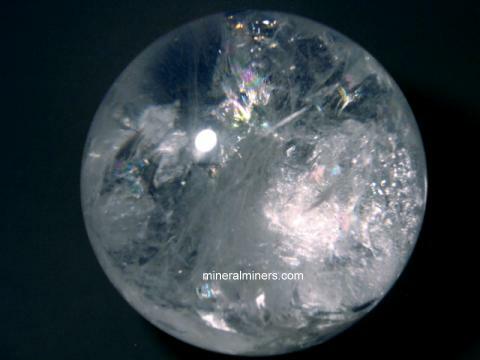 It is colorless with a tapering shape, and it has semi-vitreous to vitreous luster with very well-developed horizontal striations on some alternating prismatic faces. 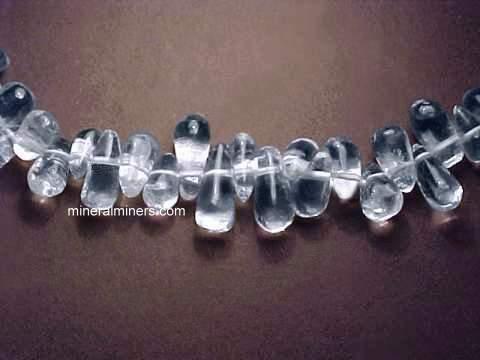 Natural quartz crystals with these characteristics, from this particular mine in Brazil, are popularly referred to as Lemurian Seed Crystals. This crystal makes a great specimen just as it is, although it could also be used as fine quality lapidary or facet rough. 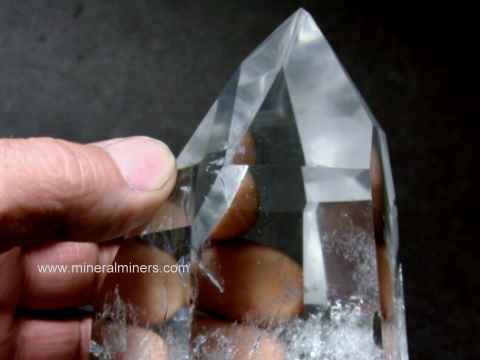 See an opposite side view of this facet grade lemurian quartz crystal. Quartz Crystal Dimensions:6.4" long x 2.3" x 2.1"
This quartz crystal specimen has rare transparency with a large clear area in the upper portion in the crystal. There is a large internal plane in the lower-middle portion of the crystal. Below this plane the quartz is only very slightly included, and in the upper portion there are no visible inclusions other than some very faint multiple phantoms near the tip! 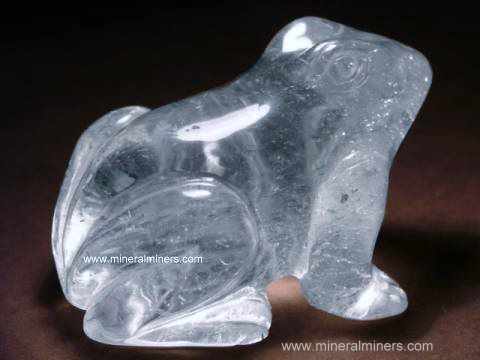 This clear upper portion weighs about 3/4 pound. The prismatic faces are in mostly good to very good condition with some minor abraded areas, and the recuperated tip is in very good condition. 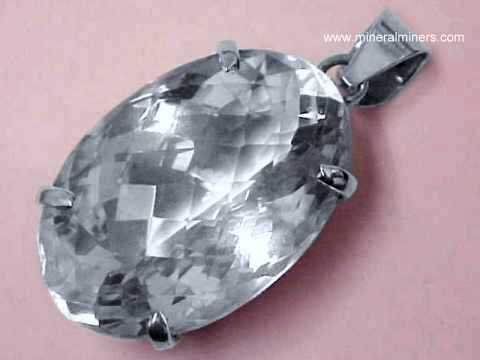 It is colorless with a tapering shape, and it has semi-vitreous to vitreous luster with very well-developed horizontal striations on some alternating prismatic faces. Natural quartz crystals with these characteristics, from this particular mine in Brazil, are popularly referred to as Lemurian Seed Crystals. This crystal makes a great specimen just as it is, although it could also be used as very fine quality lapidary or facet rough. 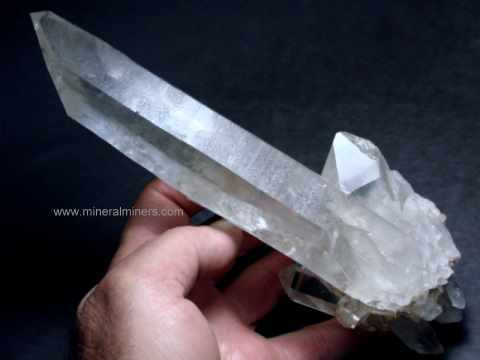 See an opposite side view of this genuine lemurian quartz crystal. Quartz Crystal Dimensions: 5.5" long x 3.2" x 2.7"
This quartz crystal specimen has very rare transparency with a large internally flawless portion inside the upper part of the crystal. This natural quartz crystal would yield a totally clean block weighing about 0.8 pounds which could be faceted into a large gemstone weighing over 800 carats! The surfaces show some abraded areas, and the recuperated tip is in excellent condition. 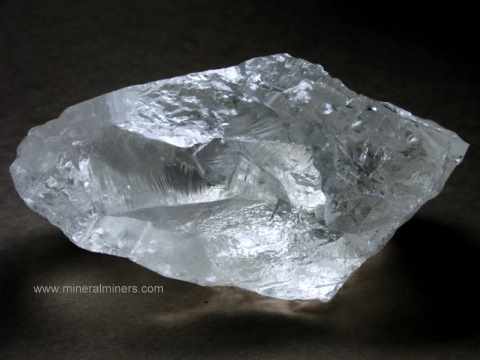 It is colorless with a blocky shape, and it has semi-vitreous to vitreous luster with very well-developed horizontal striations on some alternating prismatic faces. 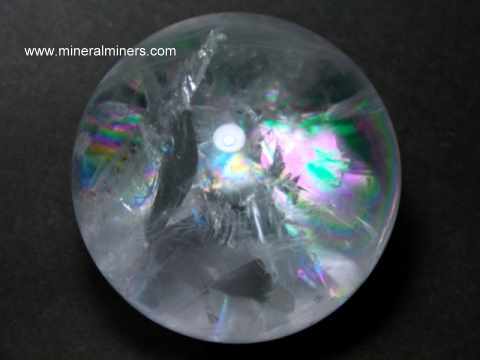 Natural quartz crystals with these characteristics, from this particular mine in Brazil, are popularly referred to as Lemurian Seed Crystals.There also is a nice rainbow reflection inside. This crystal makes a great specimen just as it is, although it could also be used as fine quality lapidary or facet rough. 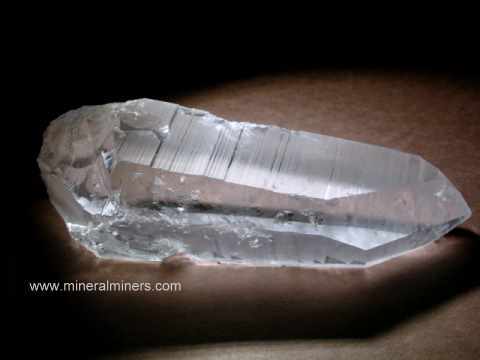 See an opposite side view of this facet grade lemurian quartz crystal. Quartz Crystal Dimensions: 4.2" tall x 3.6" x 2.7"
This polished quartz crystal specimen has very rare transparency with a large clear inside and a very beautiful internal rainbow reflection. Unfortunately, this crystal has a small chip right on the tip! 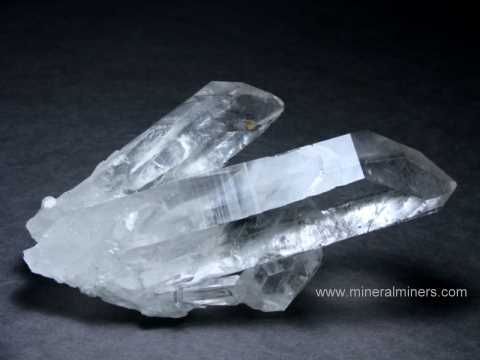 See a close-up view showing this lemurian quartz crystal tip. 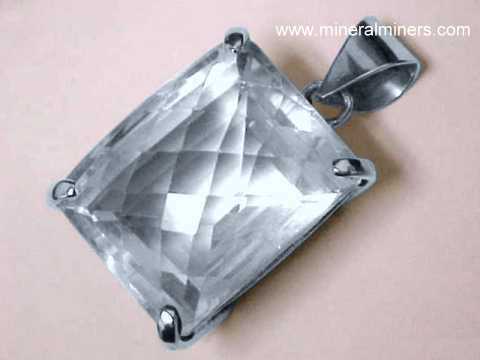 For this reason, we are offering this beautiful crystal at a severely discounted liquidation price of just $285. 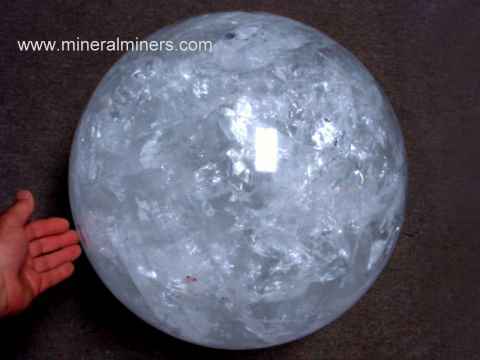 This polished quartz crystal has a huge clear area inside weighing over one pound with just a few tiny pin-point inclusions. This crystal still makes a very beautiful decorator crystal just as it is, although it could also be used as fine quality lapidary material. See a view showing the amazing rainbow reflections in this beautiful lemurian quartz crystal with rainbows. This genuine Lemurian quartz crystal measures 3.6" long x 1.4" x 1.1"
This natural quartz crystal specimen has prismatic faces in mostly good condition with some minor abrasions. This beautiful lemurian crystal has amazing flawless transparency throughout its length with just a few inclusions at its base. This lemurian quartz crystal has some crystal impressions and broken areas on its lower prismatic surfaces. This lemurian crystal has a re-finished tip in mostly good condition. This genuine lemurian quartz crystal has semi-vitreous luster with well-developed horizontal striations on alternating prismatic faces. This natural quartz crystal was discovered at a particular mine in Brazil that is very famous as the original mine of the unusual natural quartz crystals known as Lemurian seed crystals. This genuine Lemurian quartz crystal measures 4.9" long x 1.2" x 0.9"
This natural quartz crystal specimen has 100% natural prismatic faces that are mostly covered with and broken areas and crystal impressions where other lemurian crystals had grown into this crystal while it was still in the earth. The upper portions of the prismatic faces are in mostly good condition with some minor abrasions. This lemurian crystal has very good transparency throughout its length. This lemurian crystal has a re-finished tip in mostly good condition. This genuine lemurian quartz crystal has semi-vitreous luster with well-developed horizontal striations on alternating prismatic faces. This natural quartz crystal was discovered at a particular mine in Brazil that is very famous as the original mine of the unusual natural quartz crystals known as Lemurian seed crystals. This genuine Lemurian quartz crystal measures 4.6" long x 1.5" x 1.3"
This natural quartz crystal specimen has 100% natural prismatic faces with some crystal impressions on its lower prismatic surfaces where other lemurian crystals had grown into this crystal while it was still in the earth. The upper portions of the prismatic faces are in mostly good condition with some minor abrasions. This lemurian crystal has very good transparency throughout its length with a faint phantom inside about 2/3 of the way up the crystal. This lemurian crystal has a re-finished tip in good condition. This genuine lemurian quartz crystal has semi-vitreous luster with well-developed horizontal striations on alternating prismatic faces. This natural quartz crystal was discovered at a particular mine in Brazil that is very famous as the original mine of the unusual natural quartz crystals known as Lemurian seed crystals. This genuine Lemurian quartz crystal measures 4.75" long x 1.7" x 1.2"
This natural quartz crystal specimen has 100% natural prismatic faces in mostly good condition with some abrasions. 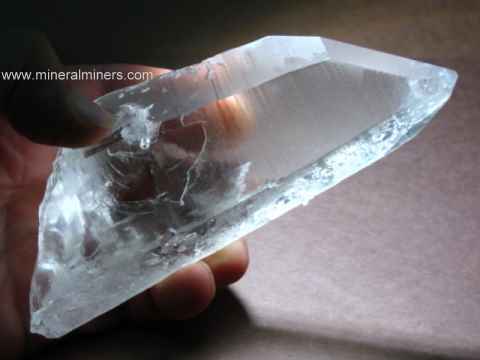 This lemurian crystal has amazing internally flawless transparency. See also another view of this genuine lemurian crystal. It has a re-finished tip in very good condition. This genuine lemurian quartz crystal has semi-vitreous luster with well-developed horizontal striations on alternating prismatic faces. This natural quartz crystal was discovered at a particular mine in Brazil that is very famous as the original mine of the unusual natural quartz crystals known as Lemurian seed crystals. This genuine Lemurian quartz crystal measures 4.25" long x 1.9" x 1.5"
This natural quartz crystal specimen has 100% natural prismatic faces in good condition with some crystal impressions along one side. 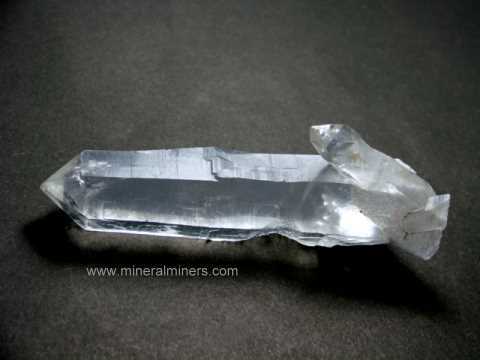 This lemurian crystal has very rare transparency throughout its length. It has a re-finished tip in good condition. This genuine lemurian quartz crystal has semi-vitreous luster with well-developed horizontal striations on alternating prismatic faces. This natural quartz crystal was discovered at a particular mine in Brazil that is very famous as the original mine of the unusual natural quartz crystals known as Lemurian seed crystals. This genuine Lemurian quartz crystal measures 5.7" long x 2" x 1.9"
This natural quartz crystal specimen has 100% natural prismatic faces in good overall condition with many tiny lemurian crystals and crystal impressions intergrown with the prismatic faces along two sides. This lemurian crystal has very good transparency throughout its length with some inclusions right at its base. It has a re-finished tip in good condition. This genuine lemurian quartz crystal has semi-vitreous luster with well-developed horizontal striations on alternating prismatic faces. This natural quartz crystal was discovered at a particular mine in Brazil that is very famous as the original mine of the unusual natural quartz crystals known as Lemurian seed crystals. This genuine Lemurian quartz crystal measures 6.2" long x 2.2" x 1.75"
This natural quartz crystal specimen has 100% natural prismatic faces that are mostly covered with broken areas and crystal impressions where other lemurian crystals had grown into this crystal while it was still in the earth. The upper portions of the prismatic faces are in very good condition with faint brown-pink natural color. This lemurian crystal has inclusions at its base, and the rest is very clear with a large internally flawless area inside. This lemurian crystal has a re-finished tip in very good condition. This genuine lemurian quartz crystal has semi-vitreous luster with well-developed horizontal striations on alternating prismatic faces. This natural quartz crystal was discovered at a particular mine in Brazil that is very famous as the original mine of the unusual natural quartz crystals known as Lemurian seed crystals. This genuine Lemurian quartz crystal measures 7" long x 2" x 1.7"
This natural quartz crystal specimen has 100% natural prismatic faces that are in mostly very good condition with some minor abrasions. This lemurian crystal has inclusions at its base, and the rest is very clear with some faint phantoms inside! This lemurian crystal has a re-finished tip in good condition. This genuine lemurian quartz crystal has semi-vitreous luster with well-developed horizontal striations on alternating prismatic faces. This natural quartz crystal was discovered at a particular mine in Brazil that is very famous as the original mine of the unusual natural quartz crystals known as Lemurian seed crystals. This genuine Lemurian quartz crystal measures 6.9" long x 2.5" x 1.7"
This natural quartz crystal specimen has 100% natural prismatic faces that are in mostly very good condition with a crystal impression along one side. This lemurian crystal has very rare transparency throughout its length with a re-finished tip in very good condition. See also another view of this genuine lemurian crystal. This genuine lemurian quartz crystal has semi-vitreous luster with well-developed horizontal striations on alternating prismatic faces. This natural quartz crystal was discovered at a particular mine in Brazil that is very famous as the original mine of the unusual natural quartz crystals known as Lemurian seed crystals. 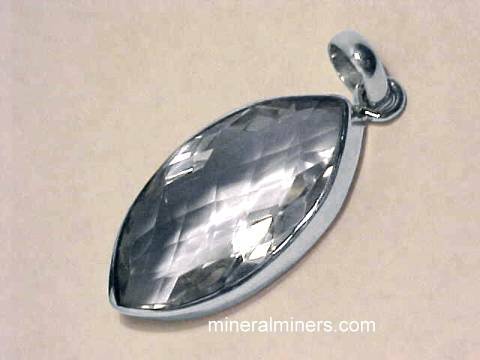 Each one of our lapidary grade Lemurian crystals was mined in Brazil at the original lemurian quartz crystal mine. 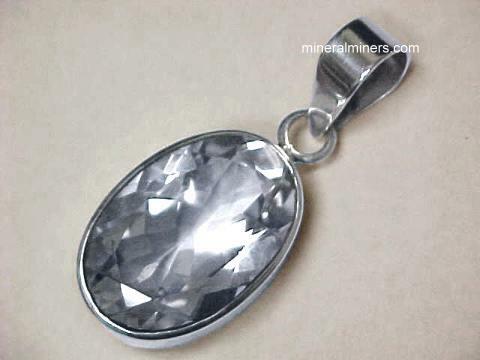 Our lapidary grade lemurian crystals are completely natural. 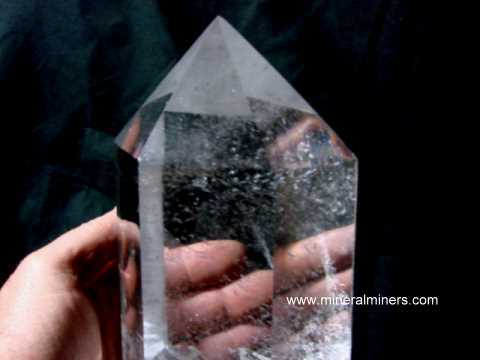 Here at mineralminers.com, we do not have any heated or treated lemurian crystals, each crystal is 100% natural! We have some very rare quality natural lapidary grade lemurian crystals with facet grade transparency and large internally flawless areas, and we do have more lemurian crystals in stock, including some very rare large size lemurian crystals! 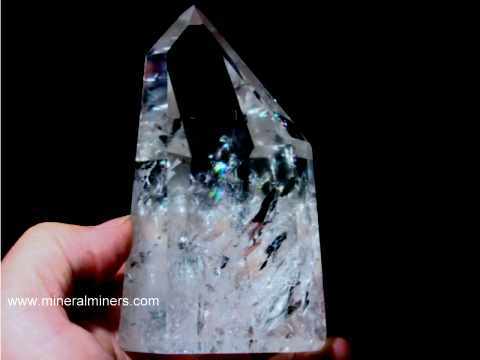 We traveled to the original lemurian crystal mine in Brazil several times a year to purchase directly from the mine owners each year from 1985 up until the original lemurian crystal mine closed permanently in 2006. We still have a limited amount of additional inventory from the original lemurian quartz crystal mine in naturally terminated crystals, rough pieces, polished crystals, and spheres. 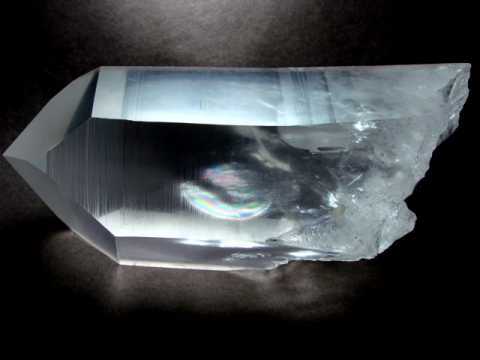 Information about genuine rock crystal quartz and its history, physical properties, chemistry, occurance, and metaphysical uses is displayed on our quartz information page. 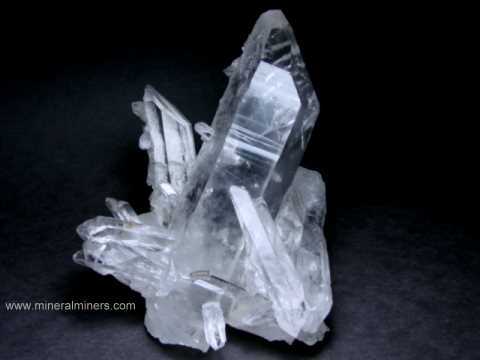 For more information about quartz crystals and their history, physical properties, chemistry, occurance, and metaphysical uses be sure to see our quartz crystal information page. 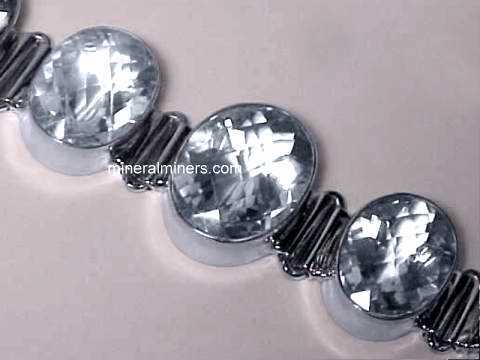 We also have available some polished lemurian crystals. Would you like us to inform you when we add more natural lemurian quartz lapidary rough on this page? 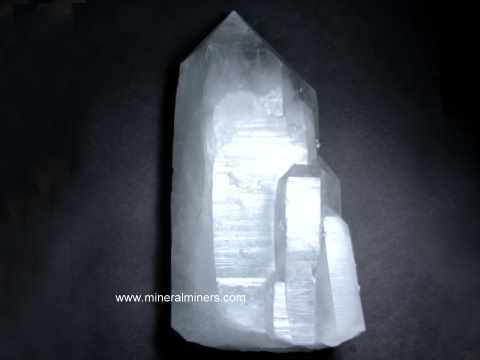 We have a large inventory of natural Lemurian quartz crystals in stock in all sizes and qualities, direct from the original Lemurian quartz crystal mine in Brazil, so be sure to let us know if you have any Lemurian quartz lapidary rough special requests.